“You know, microwave causes cancer?! I have decided to stop using it.” This got a bemused, almost sneered look on my mom’s face, the first of it’s kind, especially considering she had come to visit me after a year. Over the course of her trip, I kept showing off all my latest lifestyle changes…organic eating, the boycott of processed foods, the stainless steel additions in the kitchen, my yoga routine, the all-natural beauty regime, and even the reincarnation of the balti-bath (well, the water campaign by Shekhar Kapur combined with my clogged shower head sealed that deal!). She didn’t say much, but couldn’t hide the “Havent you come a full circle?” look on her face. She left a few days later, leaving me behind with the thought to ponder on. Ironic, it may seem! 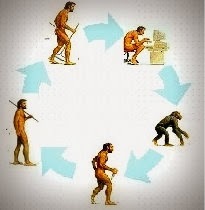 But the fact of the matter is, aren’t we all trying to come to a full circle in some way or other? How come natural healing practices are taking center stage, when we have advanced so much in allopathy? Aren’t we at the onset of an organic farming revolution, after having spent millions in research of chemical fertilizers? Why are we starting to bike/walk to work, when we now own multiple cars? Why are some of us so excited about those new flour mills in the neighborhood selling fresh chakki-ka-atta when we can readily get it in grocery stores? What about that daily dose of sun we now feed our vitaminD-starved bodies, having refrained from it for the fear of skin cancer? What about the resurgence of the eastern-style squatting toilets now being popularized by the Westerners? And isn’t simplicity the ultimate sophistication these days? And isn’t the appeal of being an “Aam Aadmi”, an endorsement of our back-to-basics mindset? So all this advancement, inventions, systems, and gadgetry! Should we have really bothered? It’s as if everything we created has had an evil side-effect that we are now striving to compensate for. Have we really progressed then, if we are constantly trying to fight the evils of our own progression? If better sense prevails, looks like I may wind up where I started off. In a household where there wasn’t a microwave or non-stick cookware or a cupboard full of processed foods; only squatting toilets, balti-baths, fresh chakki-ka-aata, and lots of sunshine. This post is dedicated to my Mom; the force behind me restarting this blog and the inspiration behind my full circle of evolution. How I miss my phone! Other one is taking ur own shopping bags – it was so “not cool” and now we all r doing it! Thats true. We are all going back where we began. Btw, Krishna: you are always an inspiration…esp, with your grounded philosophy and outlook towards life.